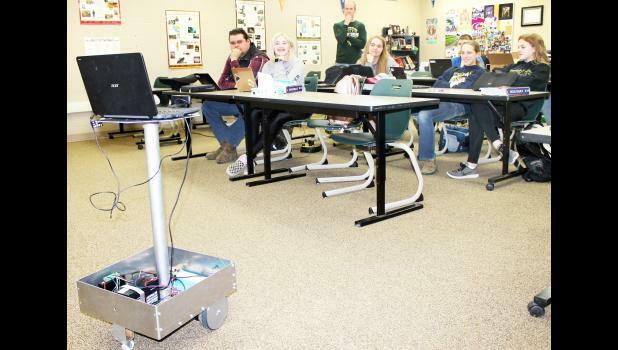 • A “virtual student” has been put together to help a Jackson Heights High School student recovering from heart transplant surgery to have a continued presence at the school while he recuperates at home. Find out more about Alex Edwards and his “virtual student” in today’s edition. • Holton Community Theatre has kicked off a membership drive to build better relationships with members of the community and find a “forever home” for the theater group. Learn how you can make a contribution. • A Jackson County Sheriff’s Office deputy was injured when a pickup truck struck him while he was investigating a non-injury accident north of Holton on Saturday night. We’ll tell you more about the accident in today’s edition. • Jackson County Arts is getting ready for its eighth-annual Art Walk around Holton’s Town Square later this month. Learn more about the two Topeka artists who are participating in this year’s event. Also, this Saturday is prom night for all three Jackson County schools. More information about this and other stories may be found by logging in to your holtonrecorder.net account and clicking on E-Editions.